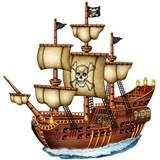 Today is International Talk Like a Pirate Day, a holiday dreamed up by John Baur and Mark Summers twenty years ago. Their dream became a reality when the guys got Dave Barry to write a column about a day dedicated to, well, talking like a pirate. You can find the full story of the origins of this glorious excuse for a party on the official TLAPD website (don’t skip the Sing-Along video). The only wench who hasn’t slapped me face. Before the sun melts the black tar we smear’d. Don’ believe me, eh? Go down to me hold. You’ll swim in me heart with a mermaid’s grace. Your face depicted in this here tattoo.